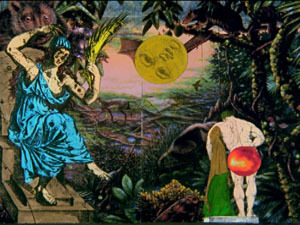 The film, an animation, unfolds in three acts: Act I, “Cyrano”, wherein Cyrano makes all manner of boasts and compares his lady-love to the marvels of the universe; Act II, “Prometheus”, in which pagan forces are compared with the supposed genteel nature of the 19th century; Act III, “Time Travel”, wherein there is a hop-scotch of Time Travel! 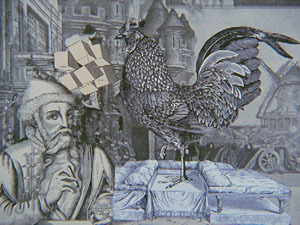 In which the viewer moves among various ‘times’, partially drawn entirely from imagination, partially from allusion to specific visual historic and pre-historic periods. 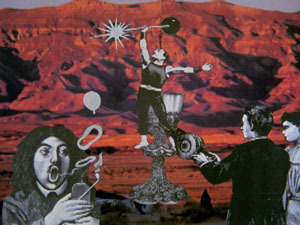 It is not a straight-line progression, rather a flipping back and forth through glimpses of various ages, carried along by the surreal antics of its objects and characters.